With continuing talks of funding cuts in UK and the impact that it will have on vulnerable parts of the economy, like the arts, it's great to hear that the Mushroom Works will be opening new artist studio spaces in Gateshead, in the North East of England. 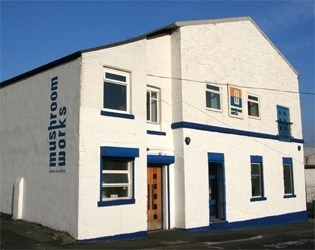 The Mushroom Works itself if an artist-led gallery and studio space that is home to a whole range of creative sector individuals, including painters, illustrators, jewellery makes, animators, architects, glass artists and furniture makers. As well as housing the artists and their work, the Mushroom Works also run classes and events to get people more involved with the arts and to develop a strong creative atmosphere in the North East. This year, the Mushrooms Works purchased an old church in Bensham in Gateshead with their sights set on turning the space into a series of studios that will be available for monthly rental. The plans are set for 12 affordable spaces to be created within the church, with people being able to rent the space for any number of creative pursuits on a month by month basis. Named Brighton Road Studios, the church is about to host an exhibition, titled "In the Beginning..." which will allow a range of artists and creatives to come together and use the space as an exhibition platform before the renovation work starts to take place. The exhibition starts on the 15th October and gives people a chance to visit the space and take a look at the sort of work that already goes on as part of the Mushroom Works program. Earlier this year there was also a call for anyone who knew anything about the history of the church on Brighton Road, to get in touch with the Mushroom Works. If you do know anything, or just want to find out more about this project, you can call the Mushroom Works on +44 (0)191 224 4011, or contact Justin Keeper.